This Property is 100 Pct. Non-Smoking. 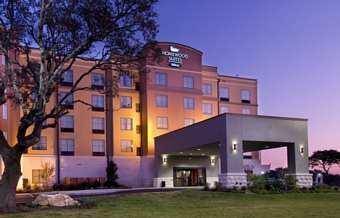 The Homewood Suites by Hilton San Antonio North hotel in Texas is located in the beautiful Stone Oak suburb of San Antonio Texas close to numerous office buildings medical facilities well-appointed shopping areas and adjacent to Cornerstone Church. Major businesses in the area include North Central Baptist Hospital Stone Oak Physicians Plaza South Texas Spine and Surgical Center Medical Park at Stone Oak and Methodist Stone Oak Hospital. The Homewood Suites by Hilton San Antonio North hotel in Texas is either within walking distance or a short drive from over 40 restaurants. Shopping at the Shops at Hardy Oaks The Rim and the Shops at La Cantera are only 5 minutes away. The famous San Antonio The Alamo SeaWorld and Six Flags Fiesta Texas are all a very short drive away. The Homewood Suites by Hilton San Antonio North hotel in Texas features 61 two-room/separate living and sleeping areas/ suites and 45 studio suites. Every room features a fully-equipped kitchen with a full size refrigerator microwave oven coffee maker complimentary wireless high-speed internet access two 32 inch LCD HD televisions and on-demand movies. An iron and ironing board two speaker phones and hair dryer are standard in all rooms at this Homewood hotel. Guests of the Homewood Suites by Hilton San Antonio North hotel in Texas have complimentary use of the business center as well as our complimentary Suite Start hot breakfast which is served daily and our complimentary Welcome Home Reception Monday through Thursday evenings. The Homewood Suites by Hilton San Antonio North hotel in Texas features an on-site guest laundry complimentary grocery shopping service outdoor heated swimming pool two barbecue grills in our courtyard and our activity court. Snacks and sundries are available in our 24-hour Suite Shop. Make yourself at home. Silo Elevated Dining offers fine International and American cuisine. Houlihan*s offers International and American cuisine.